A natural product designed to protect areas such as lawns from surface scratching, Scent Off Rabbit Repellent is the ideal repellent for organic gardens. Containing 12% nitrogen, an essential plant nutrient, Rabbit Repellent can boost plant growth and improve turf colour. The repellent works by emitting an odour that animals associate with predator activity, naturally repelling them away from the area. Stimulating a fear-based response, it encourages rabbits to go elsewhere. The odour is not unpleasant to the user and will not harm plants. 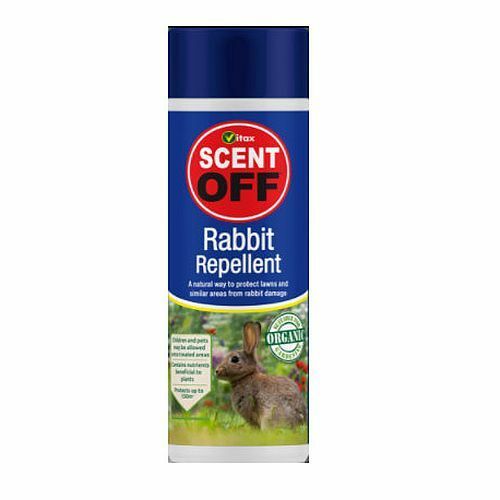 Simple to use, Rabbit Repellent should be applied as a continuous band around the area you would like to protect and re-applied every six to eight weeks. One pack can treat and protect an area up to 150m2. Should be applied as a continuous band around the area you would like to protect and re-applied every six to eight weeks. - Children and pets may be allowed onto treated areas.